In December of last year, I learned how to make kombucha, and discovered it was easier than I thought! I have been brewing batches every 2-3 weeks since. 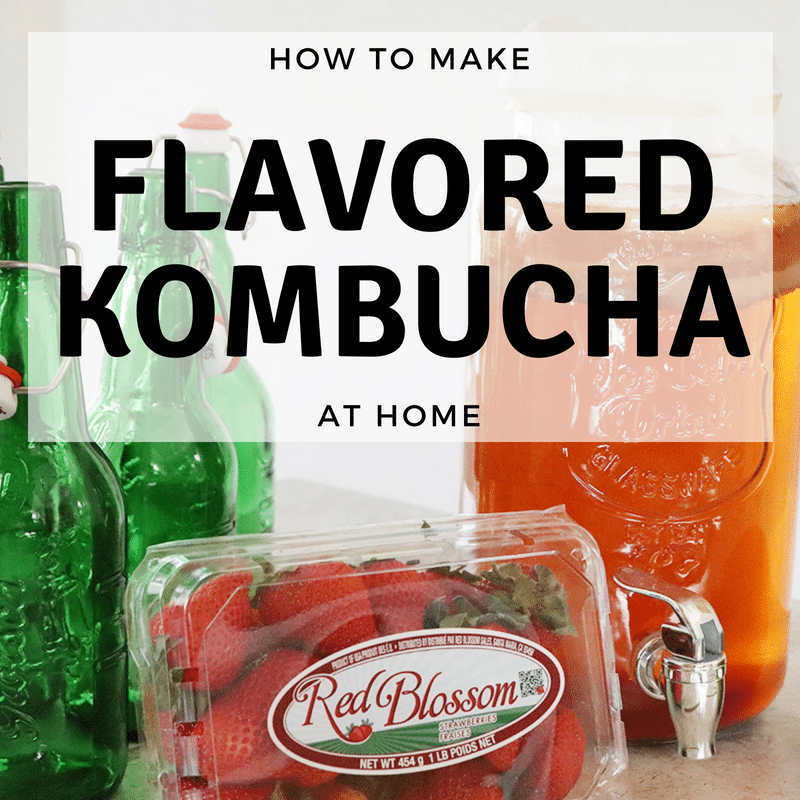 And as much as I LOVE kombucha as is, I wanted to learn how to flavor kombucha at home. Learn about the Health Benefits of Kombucha. For my first batch of flavoring kombucha at home, I bottled half of my kombucha with strawberries, and the other half with mangoes. I was surprised at how easy it was to make flavored kombucha and wanted to share my step-by-step tutorial with you! You’ll need a batch of homemade fermented kombucha to flavor it. If you haven’t made kombucha before, no worries – I have a step-by-step guide so you can learn how to make kombucha. Check it out, and when your kombucha is ready in 7 – 21 days, come back here! 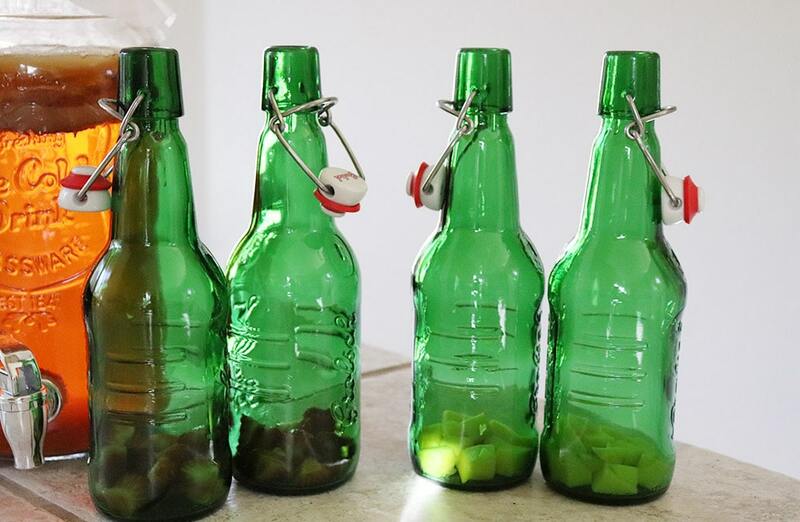 If you have your kombucha fermented and ready to bottle, move on to step 2! For fresh, dried, or frozen fruit, dice or puree and add to the bottom of the bottle, using a 10 – 30% fruit and 70 – 90% kombucha ratio. For juice, use a 20 – 10% juice and 80 -90% kombucha ratio. 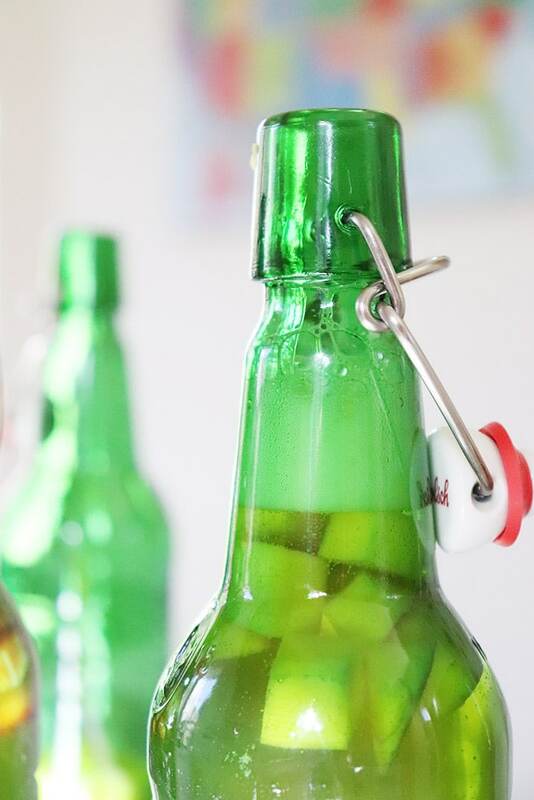 Once you know what recipe you’re using to flavor your kombucha, simply add your flavors to the bottom of a sterile glass container with a lid (I use grolsch bottles, but you can also use these). Fill to the top with your fermented kombucha, making sure to leave a few inches of head space in your bottle. and seal. 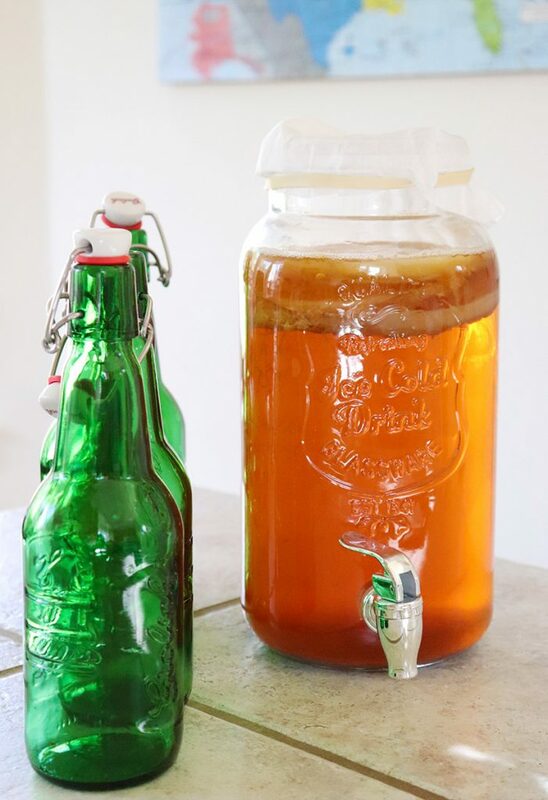 Read more on how to bottle kombucha and how to make a scoby hotel. 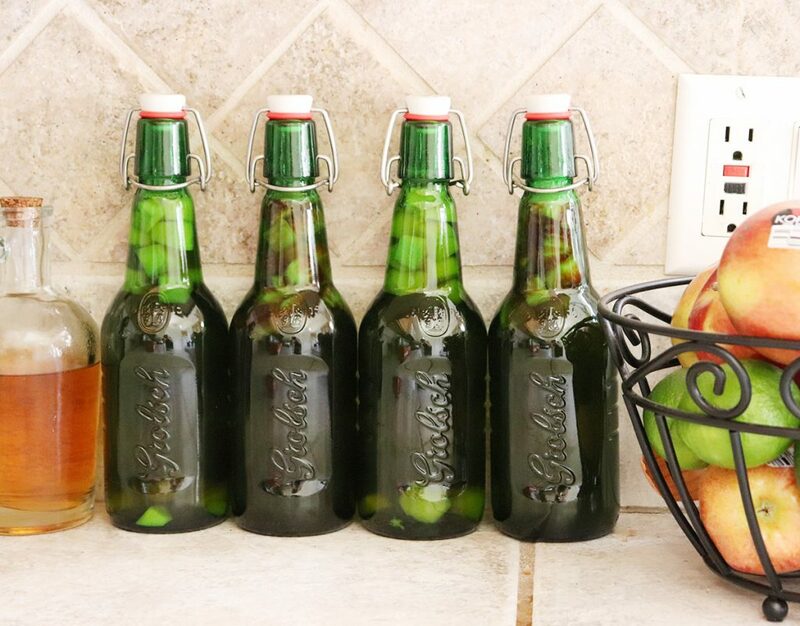 Once you have added your flavors to your kombucha, you can either transfer your bottles straight to the refrigerator, or you can do a second fermentation. The second fermentation gives your kombucha a more pronounced fruit flavor and additional carbonation. To do your second fermentation, place your airtightbottles in a dark place that is room temperature. Allow to sit 2- 4 days. 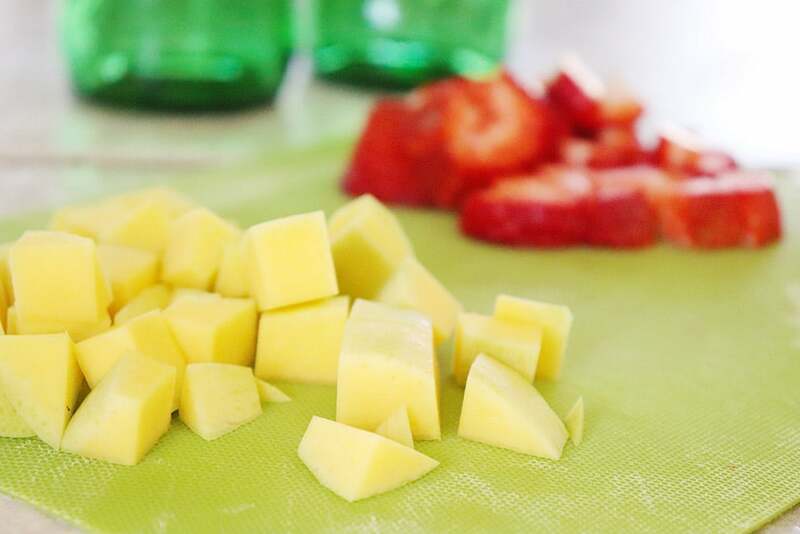 After 2 – 4 days, strain out the solids from the bottle, then pour back into the bottles and store in the refrigerator for 1 – 3 months (not that it will last that long!). Add flavors to airtight bottles. Fill with finished kombucha, leaving a couple inches of head space. Seal and place in a dark, room-temperature space for 2 - 4 days. After 2 - 4 days, strain out solids, and re-bottle. Transfer to fridge and consume in 1 - 3 months. If you’re not ready to make flavored kombucha yet, but want to later, pin this to your fermentation board by clicking on the image below. If you have any questions on how to flavor kombucha, leave a comment below! After adding the fruit for second fermentation, how do you get the solids out of the bottle? I strain the kombucha through a plastic sieve into a clean container, then discard the fruit. Thanks so much for this guide on how to flavor kombucha! So helpful. Definitely excited to flavor my own the next time I make another batch! This is so cool! I’ve only recently tried this drink and I totally dig it!!!! I think it’s so awesome that you’ve learned to make this …. are you going to keep it up? You pretty much nailed it girl. I would not mind to try your Kombucha! I feel so sheltered! Not only have I never had Kombucha, but I had never even heard of it until this post! It sounds really good, especially with the infusion of all those different flavors. I have to take a look at your post on how to make Kombucha! I have never heard of kombucha before but it looks so tastey I love that it’s a fruity drink you can make at home. It seems like a perfect summer refresher, I’ll definitely be trying this out soon. Thanks for sharing! I’m almost embarrassed to admit that I have no idea what kombucha is. I’ve heard of it, but I’ve never tried it. What a great idea! I love Kombucha and I recently went somewhere where they had flavored it. It was so good and I was thinking of trying something liek this. This looks like so yumm and healthy one. I would love to try this for my daughter. This is a great tutorial and very thorough. Thank you so much for sharing this! Another great post! This is why I love blogs, reading them, following them. A month ago I had no idea what kombucha was or even that it existed. Now I know what it is, why it is used, I know where to find the recipe to not only to make the kombucha homemade but to make it flavored as well!